When the city becomes too hot to handle, New Yorkers retreat to homes, resorts, and timeshares in the Hamptons. This close-to-home paradise boasts some of the most gorgeous and private estates in the country, many of which have just gone on the market. If you happen to stop by the Hamptons this summer or you are looking for an amazing home to buy, check out a few of the most illustrious properties on sale now. Traveling through Montauk, you may stumble upon the first house on this list: 125 Soundview Drive. From the outside, this estate looks calm and serene with its weathered siding and white trim, but opening the door leads you into the most colorful home in the Hamptons. 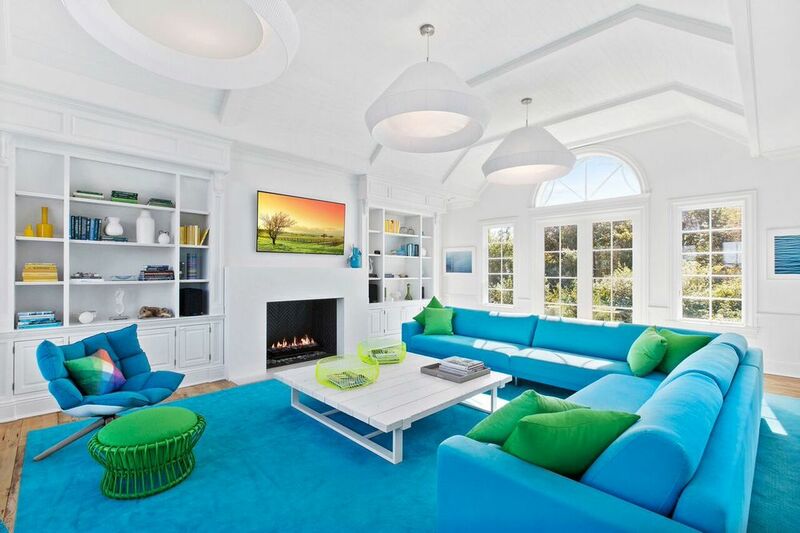 The interior completely juxtaposes the traditional beach house exterior with its vibrant, fun colors and modern furnishings. Selling for $5.85 million, Soundview Drive includes amenities such as 6 bedrooms- all done in a different neon color, 4 en-suites, 7.5 bathrooms, a wine cellar, an indoor ping pong room, and a relaxing outdoor pool space. This home is certainly made for entertaining with its fun indoor environment and luxurious resort-like backyard; it’s the kind of home which calls for a margarita in your hand at all times. Keeping in theme with the home for entertainers is this next listing, 100 Crescent Ave in Water Mill South. This modern home features the only rooftop tennis court in the Hamptons which is perfect for those who want to play for fun or show off their skills in an all-out tournament. 100 Crescent Ave was also just chosen this year to be the “2016 Holiday Hamptons Showhouse”. The 2-acre property backs up to water with both gorgeous Mecox Bay and ocean views and a private dock. With seven bedrooms, eight and a half bathrooms, and an outdoor space with an infinity pool, this home boasts over 13,000 square feet of living space. If you’re in the market for this home of $17.9 million, make sure to have a pretty extensive guest list always on hand. 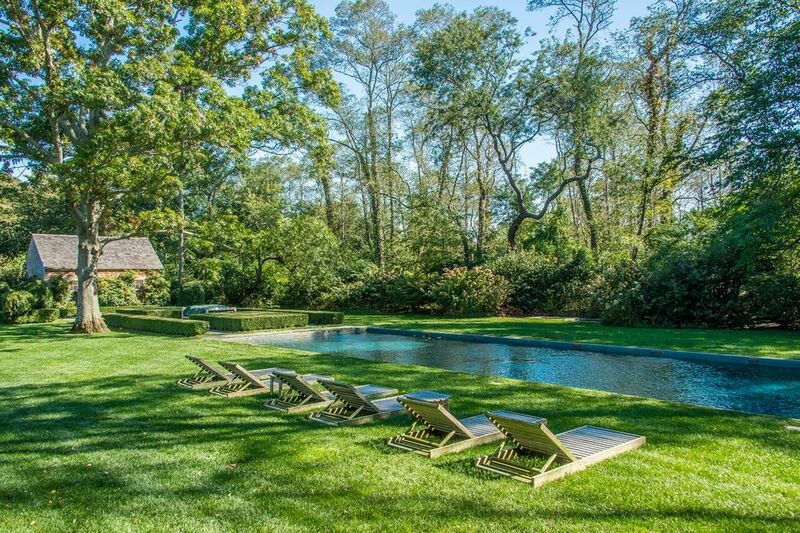 Unfortunately, two other amazing Hamptons homes that were on the market have just been sold. The first, a $2.5 million home in East Hampton that was owned by Sandy Gallin, the talent manager of both Michael Jackson and Dolly Parton, features a picturesque backyard of manicured shrubs and a large pool. The other home which is sadly in contract is a major part of Hamptons history, having been built in 1897. That estate, “Shorebluff”, is comprised of 9 acres, 3 buildings and includes a private 250 ft. space of the Peconic Bay beach. The summer has already begun, so if you are still hunting for that perfect Hamptons home, be sure to make some calls fast or miss your chance at these luxurious getaways! Photos Courtesy of Douglas Elliman Real Estate.